Strolling through the streets of Killarney, we take the opportunity to check out a few restaurants to see where we might dine this evening. We check out the Flesk Restaurant where we dined on our previous trip. Peering through the window and from the weather-worn menu in the restaurant window, it reminded too much of a group-type place and on a Saturday night it could be a bit rowdy and noisy. We next check out the menus at Gaby and Foley’s and they are as expensive as they were many years ago. We finally decided to give Robertino’s a go. We don’t remember seeing this restaurant before, but the waiter assures us that they’ve been in business for 18 years. We order a spread of dishes to try out the food here – insalata capresse, vongole al pommodoro, gamberoni, pizza quatro formaggi and penne arrabiata. From the outside, Robertino’s looks like a small restaurant, but it is actually quite a large place, taking 100 covers at a time. The front section of the restaurant is noisier as groups are seated there. If you want a quieter dinner experience, ask to go to the back room. Just before you get to the back section, there is a small section to the right, on a little platform. This is the most private section and where we dined. Robertino’s has a nice range of traditional Italian dishes, seafood mains and meats. 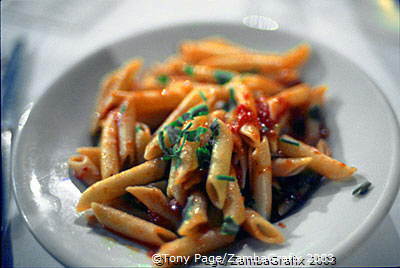 I notice that the people around us are mostly having pastas which look appetising. The prices at Robertino’s are reasonable, but the wine is on the expensive side. Our Corvo is 30 Euros, and this is the most expensive item on the bill. Robertino’s is on High street in Killarney, not too far from our Killarney Towers Hotel in College street.